If you don't see the "Save library as template" link in the document library settings page of your SharePoint site, just look at the url of the Library Settings page - you will see there is a "listedit.aspx" present in the url. Change that with "savetmpl.aspx" and voila! 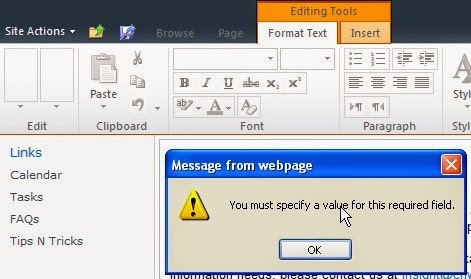 If you are working in a SharePoint project and at the time of working in a SharePoint page, starts getting an error stating "You must specify a value for this required field" at the time of saving the changes done to the page though you are sure you have all the webPart properties are set with right values, then check one more thing - are you using custom master page? Many times when we design custom master page, we comment out the code block inside the master page which is responsible of showing the Navigation Breadcrumb inside the ribbon. That block is present under the div tag with id 's4-workspace' and with asp:ContentPlaceHolder id="PlaceHolderPageTitleInTitleArea". 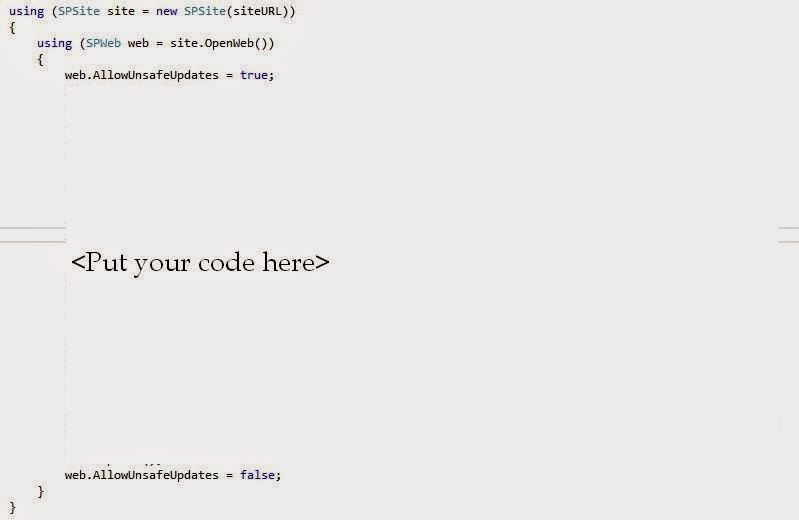 So make sure this ContentPlaceHolder is not commented out. If you don't want it to appear in your master page, you can use the Style="display:none" function as shown below. Save it and go back to the page where you got the error and try to save it. You will see the page will be saved without throwing any error! Many time we have got requests from end users and site owners to change the out of box site logo's behavior so that when they select it, it should take them to the home page of the root site collection. And this is a very fair request and the common behavior of most of the websites present in the internet. The default behavior of the SharePoint site logo is to take you to home page of the current site from where you have selected the logo. To change it open the Master Page of your site in Edit mode in SharePoint Designer. Search for the div id 's4-workspace'. Little inside that div you are going to find a Table Column with class 's4-titlelogo' and "SharePoint:SPLinkButton runat="server" NavigateUrl="~site/"... inside that column. Just change the NavigateUrl property value to "~siteCollection/" and save and publish the master page. Now go back to your site, navigate to any sub-site and from inside that sub-site, click on the site logo and you will notice it will take you to the home page of the root site collection. Thats it! To add ECB Menu Item for specific SharePoint List or Library, first you need to know the Registration ID for that list. To get that, go to the desired List's Settings page and then select Advanced Settings. In that page, enable Management of Content Types and select OK. Now in the List settings page, go to the Content Type Section and select the Content Type listed there. Copy that CType as that is going to act as your Registration ID. Another way is to create a Site Column of type “Image with formatting and constraints for publishing” in the root site collection. Once you have created this site column, you can add it to any existing list/ library and then at the time of adding an item you can just use this property to add a picture with hyperlink and if you set “Open in a new window” property for the newly added site column, the link will open into a new window. Unfortunately I was not able to fix it and after doing a lot of RnD was not able to find a conclusive solution. It looks like a read/write lock problem and I was not interested in sending a thread to sleep. So I changed my logic a little bit and started implementing the same logic in Item_Updated event. So if you face the same error, then if Googling doesn't help you much, then I will suggest to tweak the logic and use Item_Updated event! Sorry!